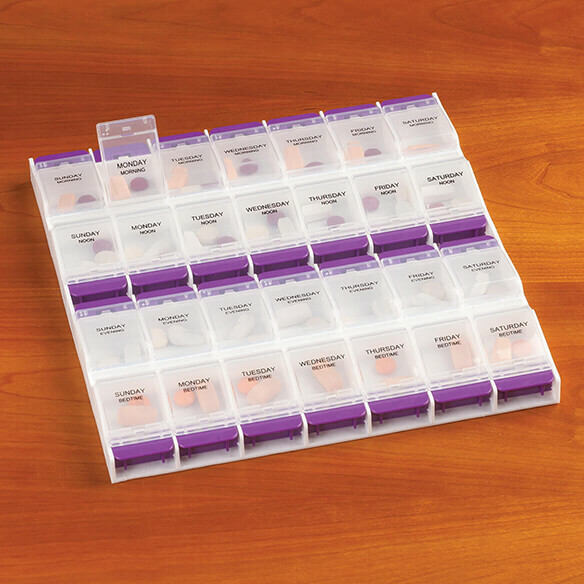 Managing medication can be simple and accurate with this oversized easy-open weekly pill organizer. Designed for easy visibility and access, it features brightly colored, easy-press buttons, large print and curved wells. 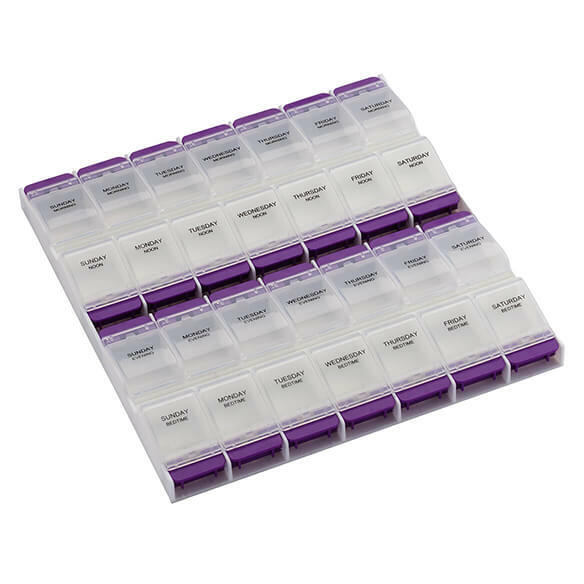 Perfect for caregivers, seniors, or anyone who takes multiple medications or supplements. 28 spacious compartments — 4 for each day of the week, including morning, noon, evening and bedtime. Pill container measures 9 1/4"L x 8 3/4"W x 1"H overall. 1 1/2"L x 1 1/4"W compartments. The only thing good was size. Pill compartments are large and just what I wanted. I was very happy when I opened it and very disappointed moments later when I handled it. The compartments popped open with the lightest touch, and that means you live in fear of spilling expensive pills. I put my pill organizers in zip lock bags because I travel a lot, and every time I slide the organizer into the bag, a few compartments pop open. Unacceptable! 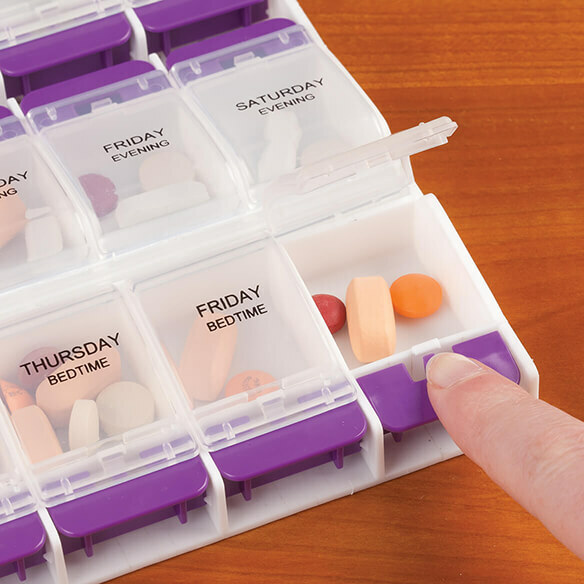 With my old organizer, I would turn it upside down and dump the pills into my hand, but it's impossible to that with this one. A few of those pills costs more than the organizer. 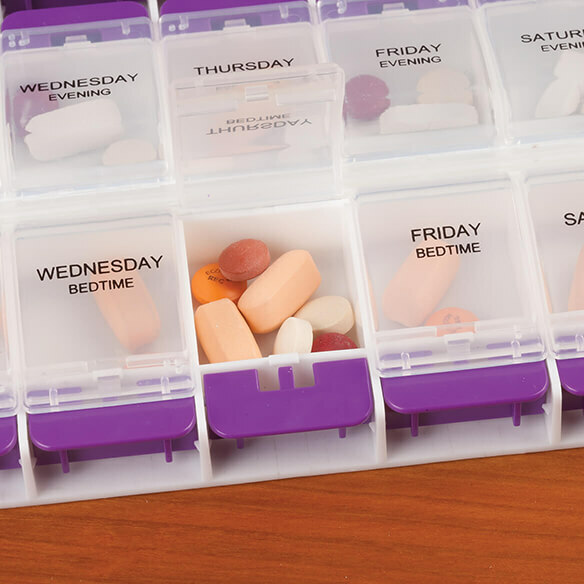 It might be acceptable if you only sit it in a drawer and take it out gingerly and carefully slip pills out of their compartment, but half of the compartments are on the interior, making it a little difficult to get those pills out. I would NOT buy this one again! I'm also not happy with "hidden" handling cost when they shouted free shipping, and it would have they seem to charge a flat $7 few to cover shipping on returns. It simply isn't worth it to deal with returning it. Major Error: No line for "[fill in the day] Evening]"
Instead of the third line of prescription containers reading " Monday [etc.] Evening" the ENTIRE THIRD ROW WAS UPSIDE DOWN and the DAYS OF THE WEEK BACKWARDS AND READ MORNING! On week one, one of the pocket tabs malfunctioned and it's not been right, since. It's a struggle to get open. I'd been delighted to find this products and not only had a genuine need for the assistance it offered, but had anticipated a terrific product. I'm very disappointed and it is unlikely I'll shop with this company again. The positives were communication and fast shipping. Or communication when the other product I ordered was not in stock. I have an old one that is falling apart. I have 2 but they are quite old. I am buying this for my mother. She already has one of the same kind and I need one more for her use. I am glad that you carry the same item, since it's no longer available from where we previously bought. Large size of each slot.